Are you a celebrity lookalike? I am - apparently. Picture the scene. I'm on vacation in Cuba, having a friendly game of volleyball on the beach with a group of people I'd never met before. All is going well and I'm holding my own quite nicely. Then the game is interrupted by a large, overweight male wearing the gaudiest pair of swim shorts I had ever seen in my life. He runs up to me in the middle of the sandy court and thrusts a napkin from the beach bar under my face excitedly saying, "Jim, Jim... please can I have your autograph? I'm a huge fan!" He was not kidding about the huge part, I can tell you, but the mistake was that he truly believed that I was Jim Carrey and he had lucked out by "bumping into me" on his vacation. Thinking practically, there is absolutely no way that Jim Carrey would be vacationing in a 3 star Cuban resort where the Cuba Libres are served in clear plastic and the food tasted consistently of palm oil. I knew that... my wife knew that... but Crazy Pants didn't seem to think that through. You see, he was totally convinced that I was who he thought I was. To quote one of Jim's characters, The Grinch..."Wrongo!" Bottom line? I have now lost count of how many people have said to me that I look like Jim Carrey. Of course, my zany sense of humour adds to the illusion. Not that I am actively seeking the recognition. I do find it amusing though. 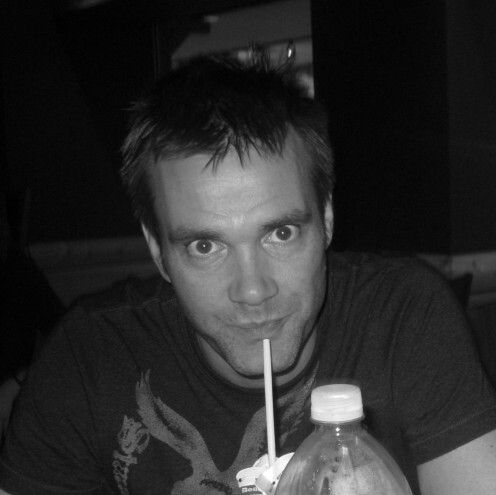 Then there are the others who say I look like UFC fighter Rich Franklin. 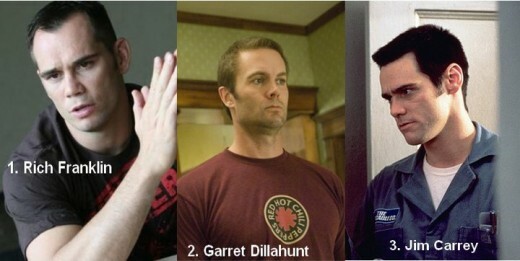 Then there's the actor Garret Dillahunt. I'm plagued with "resembling" at least three famous people? How about you? Do you look in the mirror and take a second glance because you find yourself staring at the very actor/singer/sportsperson you saw on TV just last night? I wonder is this a career I should be pursuing? You know, stand in stunt funny man for Jim Carrey? There are people out there who make a living out of being someone else you know. I don't fancy being a stand in UFC fighter though! You see my picture above and you see my alter-egos. Do you see what the guy in Cuba saw? Anyone else been asked for somebody else's autograph? I have... and no doubt will again. The Day I Met The Celebrity Of My Dreams And Made A Complete Idiot Of Myself! @lambservant - too kind, too kind. I actually feel that I am the fortunate one to have my wife - her photo would out shadow mine by far! This is funny. When I first saw your profile pic I thought "He looks like some celebrity but I can't quite pinpoint it." When I was 40 - 50 pounds thinner, many years younger, and with much shorter hair I was told a couple of times I looked like Demi Moore. Not true at all but sometimes in my photographs I did. You are a handsome fellow whoever you are. Lucky wife you have there Pete. Blessings brother. I see how you could resemble Jim Carrey. haha anywho thanks for the story and I found it funny how the guy didn't realize that you weren't Jim but I do think that it is a good idea that you should be a stand in actor for Jim. that would be awesome. thanks for the hub. Voted up and shared. @citywolf - some good ladies to be looking like... Thanks for the comment. I've been mistaken for Allison Lohman and told I look like Michelle Williams. One person told me I look like Scarlett Johansson, which is patently untrue, but I chose to take it as a compliment regardless. I love Jim Carrey but can't see it sorry! lol! but its funny isn't it how people see something like that, maybe in reality compared to a photo you probably have the same sort of expressions, that's what does it I think, just imagine, you could make a fortune! lol! @craiglyn - firstly, hello to a fellow Ontarian! I can see from your profile pic the Lily Tomlin resemblance. I guess we should be "monetizing" these lookalike opportunities really...lol! @CrisSp - I'm glad you agree about the resemblance - that tells me I'm not cracking up completely! Good for you. 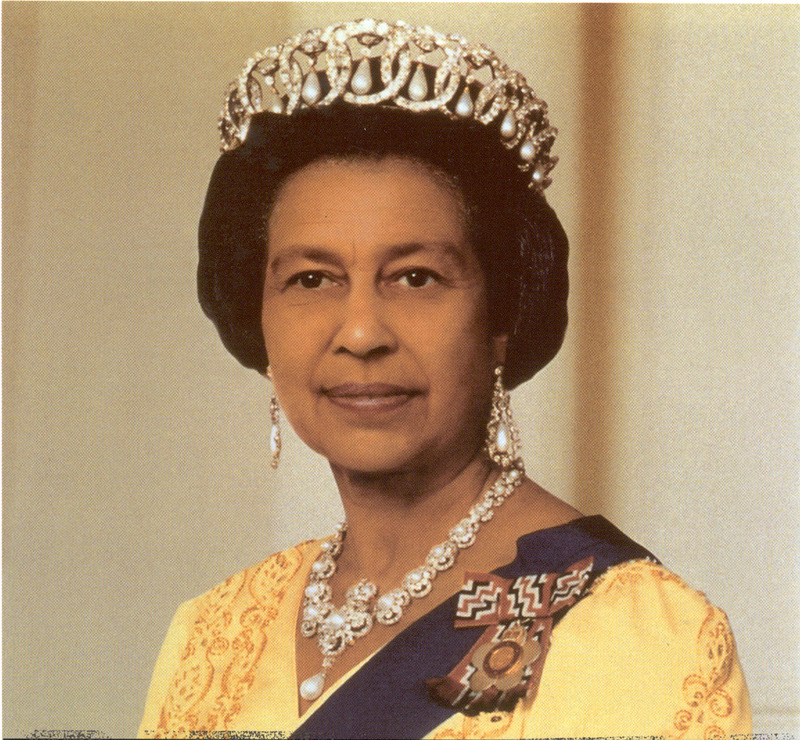 Looking at those pictures above, yes, I think there is quite a resemblance. (: I hope you took it as a compliment from that guy at the beach. @Suelynn - Wow, Victoria Principal? I can think of a lot worse people to look like! Thanks for the visit. @fpherj48 - The pic on the hub doesn't do my Jim side justice. It's way too common an occurrence for it not be true though. It sounds like you have quite the celebrity family. I say milk it for all it's worth! My my....Rich Franklin of MMA fame...yes! very much so! I don't see the Jim Carrey so much.....maybe it's the picture. My son is a Ben Afleck Clone......and his wife, my DIL looks exactly like Angie Everhart.....I wish I had pics I could send you.....but I have none in my computer. Love this hub, Petenali! You DO resemble Jim Carrey and if you get up to high jinks the way he does.... VOILA! Laura's story is interesting, I hadn't thought about having a whole career based on looking like someone else. My late father-in-law used to say I looked like Victoria Principal, but I've changed quite a bit....and so has she! :) Voted Up and across the board! Glad to meetcha! tjdavis, alas I did not sign the autograph. I probably should have just for the laugh. Maybe next time. As for looking like someone else, it's not all it's cracked up to be. All the paparazzi, agents, etc.etc..... just kidding. Well unfortunately no one has ever said I looked like anyone but myself. It was a very cute article and BTW...did you sign the autograph LOL?? Hi petenali or is it Jimbo!!!! You could be missing a vocation here! I was stopped at a wedding in Dublin by an American girl who had been giving me strange looks outside the church, she thought i was Sharon Stone . .i wish!!!!!!! Since then i got a number of similar remarks which i could not for the life of me see. Great article will share it and voted! Ha!Ha! YES! Thanks, sir. Great sense of humor! Make sure you don't hesitate the next time someone asks for an autograph. Just play along! Phew, I thought I was being chastised there :-) Did you want an autograph then? Clarification: DO give the autographs. Mr. Potato Head...smh. Foul, Pete! Foul! No encouraging the madness! @ithabise - lol, no I didn't give the autograph, although that is a good idea for next time. Note to self - practice my Jim Carrey autograph. Oh, btw, Mr Potato Head is a pretty cool guy. I met him in Disneyworld. Did you give the autograph though? ;) You can simply tell them no and that the person is a close relative. You have decent look-a-likes: be thankful. I AM the brother of Mr. Potato Head! Thanks for the comment Laura... I checked out your website. Maybe there is a future in this for me too. By the way, Petenali, you're cuter than Jim Carrey. since I was little to now I've had random people tell me that I look like drew barrymore. My current picture isn't the best for it, but I actually have a couple pics that when I look at them I have to do a doube take. petenali I was thinking you kind of look like fergie's husband....i forget his name! I have had more than 20 people over the last 5 years tell me I look like Sigourney Weaver. Only in her dirty picture from alien do I see it, but it does happen quite frequently. Well, many years ago, I was told I looked like a celebrity or two. I haven't been able to afford the surgery to keep it going since then, though . . .
Fun hub! Voted up, interesting and funny. Also shared here on HP.